IIM CAT 2018 Notification, Check eligibility criteria and other details. IIM CAT Official Notification 2018 released: The Indian Institute of Management (IIM) has released the official notification for Common Admission Test (CAT) 2018 on its official website, the link for which is www.iimcat.ac.in. This year, IIM Calcutta will conduct the CAT 2018 on Sunday, November 25, 2018 at around 147 test centres around different cities. 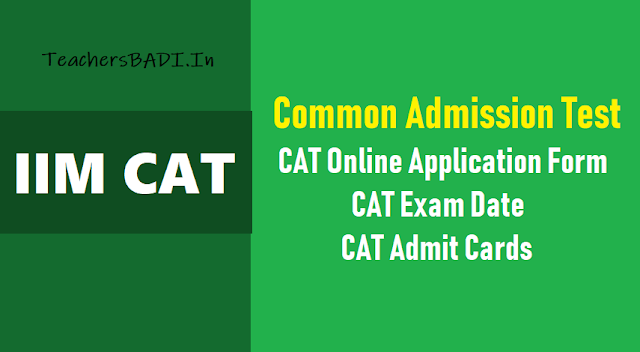 Common Admission Test, CAT 2018 registrations have been extended. Candidates interested in filling the online application forms for CAT 2018 can now do so till September 26,2 018. Earlier the CAT 2018 registrations were scheduled to close today, September 19, 2018. The last date, however, was extended. The online application forms 2018 can be filled till 5 pm on September 26 on iimcat.ac.in. IIM CAT 2018 Exams on November 25, dates for admit card, registration: Common Admission Test for admissions to IIMs across the country will be held on Sunday, November 25, 2018. This year, IIM Calcutta will conduct the examination in 147 cities across the country in two sessions. The online registration to apply for the CAT examination will begin on August 8 and will continue till September 19, 2018. The admit card will be released on October 24, and students can download it through the official website, iimcat2018.in. As per the schedule, the online registration for the CAT 2018 will begin on August 8 and will continue till September 19. All the candidates interested in applying need to possess a Bachelor's degree with at least 50 per cent marks or equivalent CGPA (45 per cent in case of the candidates belonging to Scheduled Caste [SC], Scheduled Tribe [ST] and Persons With Disability [PWD] categories), awarded by any university or educational institution as incorporated by an Act of the Parliament or State legislature in India or declared to be deemed as a university under Section 3 of the UGC Act, 1956, or possess an equivalent qualification recognized by the Ministry of HRD, Government of India. Meanwhile, candidates appearing for the final year of Bachelor's degree/equivalent qualification examination and those who have completed degree requirements and are awaiting results can also apply. Further, candidates can get more details on eligibility criteria once the official notification is released on iimcat.ac.in. The CAT 2018 entrance examination is held for admission to these 20 IIMs and more than 100 institutes across India. Ahmedabad, Amritsar, Bangalore, Bodh Gaya, Calcutta, Indore, Jammu, Kashipur, Kozhikode, Lucknow, Nagpur, Raipur, Ranchi, Rohtak, Sambalpur, Shillong, Sirmaur, Tiruchirappalli, Udaipur, Visakhapatnam. In addition, candidates will be allotted exactly 60 minutes for answering questions in each section and they cannot switch from one section to another while answering questions in a section. The examination will be of 180 minutes and candidates will be allotted sixty minutes for answering questions in each section and they will be restricted to switch from one section to another. The questions will be in three sections, A. Verbal Ability and Reading Comprehension, B. Data Interpretation and Logical Reasoning, C. Quantitative Ability. The selection of candidates will be done on the basis of a Written Ability Test (WAT), Group Discussion (GD), followed by a Personal Interviews (PI) round. All the selected candidates will get admission in around 20 IIM institutes established in various parts of the nation. For more updates, candidates are advised to keep a close check on the official website of IIM.